Gupta used her writing and passion for film as tools to shape her career. In the 1980s, she regularly contributed to magazines and won many writing competitions, but she said there were no university programs in India that offered courses in filmmaking or journalism at that time. While she was studying political science and commercial art at the University of Delhi, however, she met Siddharth Sanyal. At the time, Sanyal was producing magazines under an organization called Workbench, and he took Gupta on as a proofreader. Workbench’s office was in the same building as the production company Cinemart Foundation, which produced political and socially relevant documentaries. The company was headed by documentary filmmakers Suhasini Mulay and Tapan Bose, who became inspirations to Gupta. Nonetheless, Mulay ended up hiring Gupta because “she realized that, even though I looked really scrawny and small, I had a lot of guts.” Gupta got most of her training in the field while working for Mulay and Bose. “I learned a lot while working with her. She became my mentor, and today, she is a very dear friend,” Gupta said. In addition to giving Gupta some challenging assignments—one of which required her to travel to a remote part of Delhi to interview a Hindu fundamentalist group—Mulay was also the one who introduced Gupta to her husband. He was working as a playwright in Canada, and Gupta eventually moved to Montreal in 1991 to be with him. “When you look back in life, you realize that there was some kind of a path,” Gupta said. “All the dots connect now.” Gupta’s husband runs the Montreal theatre company Teesri Duniya Theatre, which is dedicated to producing socially and politically relevant plays. Gupta has been on the company’s board since arriving in Canada. When she first moved to Montreal, Gupta wanted to work for Studio D, a National Film Board of Canada studio dedicated to producing women’s documentaries. Unfortunately, the studio closed in 1996 due to a lack of funding. Around that time, “there wasn’t much work for new immigrants and someone who had very little or no Canadian work experience,” Gupta said. After working for a short time with a few documentary filmmakers, including Martin Duckworth, Gupta decided to go back to school. She completed a bachelor’s degree in communication studies and got her master’s in media studies, both at Concordia University. During her studies, Gupta had a special interest in social and women’s issues. 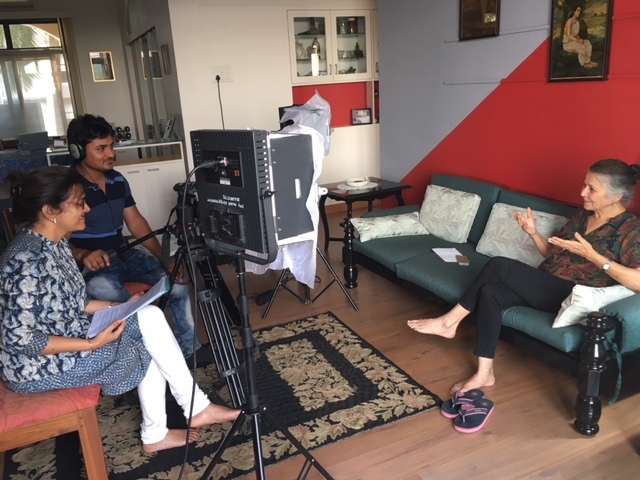 For her 1998 master’s thesis, “Confronting the challenge of distribution: Women documentary filmmakers in India,” Gupta interviewed several female filmmakers in India about the challenges they faced. A group photo with the committee members and organizers of the South Asian Film Festival. Photo courtesy of Dipti Gupta. After completing her master’s, Gupta began her PhD studies at McGill University in art history and communications. However, Gupta’s daughter made her realize she wanted to work in a system that would allow her the flexibility needed to take care of her child while doing research and teaching. Gupta has now been teaching in the cinema-video-communications department at Dawson College for 17 years. She is also a part-time faculty member at Concordia where she teaches art forms of Bollywood cinema. However, she still feels sad that she never completed her dissertation at McGill, despite finishing all her course work. She said she hopes her current work may help her eventually finish it. A portrait of Dipti Gupta, an independent documentary filmmaker, researcher and multidisciplinary artist. Photo by Sandra Hercegova. At Concordia, Gupta’s art forms of Bollywood course focuses on the study of the construct of mythology—marriage, motherhood, masculinity and misogyny—within Indian cinema, especially films coming out of Mumbai. “My aim through that is to look at this particular construct and also to break certain stereotypes that exist while viewing and engaging with popular culture from India,” she explained. These are ideas Gupta promotes outside of the classroom as well. For the last seven years, she has been on the organizing committee for the South Asian Film Festival. Hosted by the Kabir Cultural Centre, a charitable organization in Montreal, the festival highlights the work of South Asian filmmakers that focus on contemporary issues in India, Pakistan, Sri Lanka, Bangladesh, Nepal and Afghanistan. In 2017, Gupta worked as the festival’s programming director alongside her friend and fellow director Karan Singh. One film featured in last year’s festival that particularly stood out to Gupta was A Billion Colour Story. Directed by Mumbai-based filmmaker N. Padmakumar, the film discusses communal tensions and identity issues in India. It was voted Best Film by the festival’s audience. The work Gupta does for the south asian film festival is entirely voluntary as it is a volunteer-driven festival. According to Gupta, teaching at Dawson and being a part-time employee gives her more time to contribute to other projects, such as the festival. “I am growing older, and I am realizing the urgency to contribute as well as give back to the community that has really supported me,” she said. Dipti Gupta alongside filmmaker N. Padmakumar. In terms of support, as a part-time faculty member at Concordia, Gupta said she feels that the Concordia University Part-time Faculty Association (CUPFA) is supportive and generous when it comes to providing grants for research. However, the research grants are not very large. “Often, as teachers, we end up putting in our own money to pursue the work,” she said. According to Gupta, even if part-time professors only teach one or two courses, the number of hours that one puts in to create a course, to mentor or give feedback to each student is still the same as any full-time teacher. “The sad part is that, often, we are not even sure if we will continue to teach the class the following term—so you can be putting in all this work for just one term or maybe two,” Gupta added. Aside from the film festival and teaching, Gupta is an independent filmmaker herself. Using funding from CUPFA, she made a short documentary film in 2014 alongside Karan Singh called At Home in the World. The short film celebrates over 100 years of Indian cinema in the multicultural city of Montreal. It explores Montrealers’ love of Indian cinema and their understanding of films from that country.